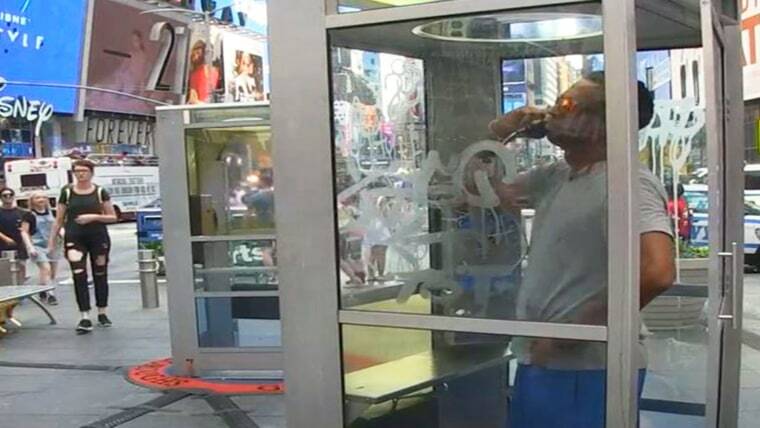 In New York City, Refurbished Phone Booths Tell Immigrant Stories to the U.S.
Telephone booths dating back to the 1980s in New York City's iconic Times Square are part of an interactive art space that transports visitors to the 1970 immigrant journeys to the U.S. Artist Aman Mojadidi teamed up with the Times Square Art alliance to create an experience that would educate visitors on immigration in the tourist capital of the world. Mojadidi gathered oral stories through workshops held throughout the city, in collaboration with 25 local businesses. "My mother carried me across the U.S.-Mexico border," said José Mejía in one of the recordings. He said he was glad he was able to share his experience of how he eventually arrived to Staten Island, New York. Participants like Mejía were able to record their story in English or their native tongue. Participants recounted their journeys from various countries, including Bangladesh, Belgium, Burkina Faso, Cameroon, China, Colombia, Dominican Republic, Egypt, Gambia, Ghana, Ireland, Israel, Italy, Japan, Jordan, Liberia, Mexico, Nigeria, Philippines, Puerto Rico, Russia, Sierra Leone, Spain, Sri Lanka, Tibet and Yemen. The display is at Times Square until September 5th.